Mexican mezzo-soprano Paulina Villarreal is establishing a career as a prominent recitalist, cabaret, operatic, and musical theater singer around the United States and Mexico. She was recently named one of the Top Prize winners at the prestigious international Lotte Lenya Competition in New York, and at the Comic Opera Guild Competition in Michigan. Ms. Villarreal, a graduate of the Cincinnati College-Conservatory of Music, has been a soloist and invited artist in important companies and orchestras around the United States like Opera Saratoga, Cincinnati opera, Opera Fusion: New Works, the prestigious Tanglewood Music Center, the Boston Pops (Boston, MA) Cincinnati Symphony Orchestra, Kentucky Symphony Orchestra, Appalachian Symphony Orchestra and the Millikin-Decatur Symphony Orchestra. 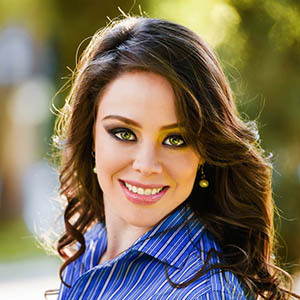 In the entrepreneurship world, Ms. Villarreal is the founder and artistic director of the annual concert series “Cantos para Hermanar al Mundo”, devoted to the promotion of classical vocal genres hosted in Northern Mexico. She is currently part of the Voice Faculty at Millikin University. Recent performance credits include a residency with Opera Saratoga, performing the role of Vera Boronel in Menotti’s The Consul, Margot in Lehárs The Merry Widow, and as a resident singer in the program Saratoga Sings. Other operatic/oratorio engagements include the role of Calavera (Death) in Rodriguez’s Frida, Driter Knabe in Mozart’s Die Zauberflöte (Cincinnati Opera), a staged version of J.S Bach’s St. Matthew Passion with the CCM Philharmonia, Alicia in Kaminsky’s Some Light Emerges, Linda Morales in Kaminsky’s new opera Postville and Marianna in Rossini’s Ill Signor Bruschino. Concert performances include a tour of William Bolcom’s Complete Cabaret Songs (Die Neue Galerie, NYC; National Women Museum of Arts, Washington DC, Cohen Studio Theater, Cincinnati) and Ricky Ian Gordon’s Cabaret show: Bright-Eyed Joy. Career highlights include Simply Sondheim: Stephen Sondheim’s 85th Birthday Celebration with the Boston POPS and Broadway veterans Jason Danieley and Kate Baldwin, Sondheim vs Webber with the Kentucky Symphony Orchestra, Macy’s ArtWave Sampler with the Cincinnati Symphony Orchestra, multiple performances with Music for all Seasons, the Wagner Society of Cincinnati and Stranger Here Myself: A One Woman Kurt Weill Cabaret with Kenneth Griffiths at the Piano.